Dan Patrevito, returned to Chicago most recently from Denver, Colorado has a show at The Tonic Room tonight February 8, 2018. 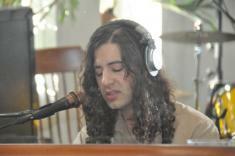 Take a listen to this brilliant Singer/Songwriter and Pianist now and then come see him tonight. As you will hear from this Podcast, He will show you a very good time.